From the #iPhone-game-as-metaphor-for-curriculum-design hashtag, we have Geared, which I purchased because I’m almost completely obsessed with little spinny things, a purchase which I almost immediately regretted. 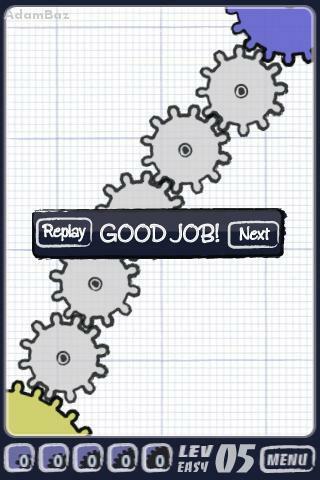 The early levels are ridiculously easy. Not a serious problem in and of itself. The same is true of Flight Plan, which you’ll recall I rather liked. But game play gets harder only over a series of completely nonsensical contrivances. You’re dropping gears into a system, blitzing your way through easy. 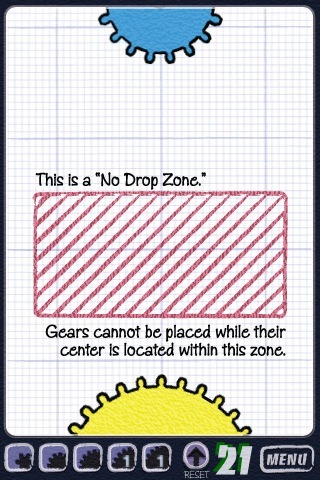 Then on level 21, as the game flips to medium, you’re confronted with “no-drop zones.” That’s really it. Everything else is the same. You’re arbitrarily excluded from routes you know would otherwise work for reasons that have nothing to do with the function of gears. whenever possible, introduce new skills and new knowledge as the solution to the limitations of old skills and old knowledge. Please argue with me here but I don’t think my freshmen really care if career professionals use math in their jobs. This “career” concept is supremely abstract to most and therefore mostly useless to me as a motivator. I’ve found a much stronger motivator in a palpable sense of forward momentum, in a coherent skill set, in real, uncontrived challenges. I’m teaching remedial Algebra for a fourth year now and the change I make to my curriculum far more than any other is to add this connective tissue. You’re comfortable with a dot plot? Fine. Let’s put you in a place where a dot plot is tough to execute — say, a large data set with no mode and a huge range. That’s annoying. Then bring in the box-and-whiskers, the histogram, or whatever. I try not to introduce the next concept simply because it’s the next chapter in the book or the next bullet point on a list of standards or because it’s “what we’re learning today.” In other words, I try to stay away from the no-drop zones. Academic Green Circumference and Area Problem from Kyle Webb on Vimeo. First, let’s pay respect to how fast the video moves, how it sets a scene and establishes a problem in just 14 slides and 57 seconds. Webb knows his audience and its attention span. 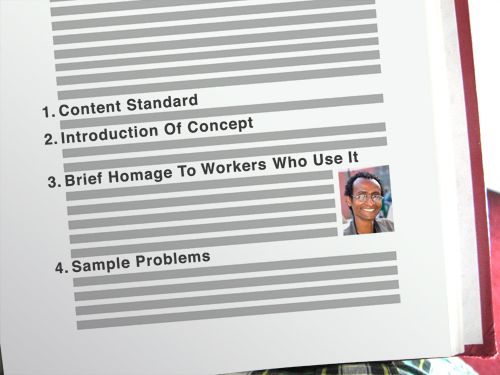 Also, none of this is stock photography. Every photo selected is of high bandwidth and relates directly to the problem. After 12 seconds, we have three different views of the lawn. After 15 seconds, a panoramic shot. I’ll begin my redesign 23 seconds in, when he mentions the lawn is 75 steps across. This is really, really close to my textbook’s own installation of the problem. 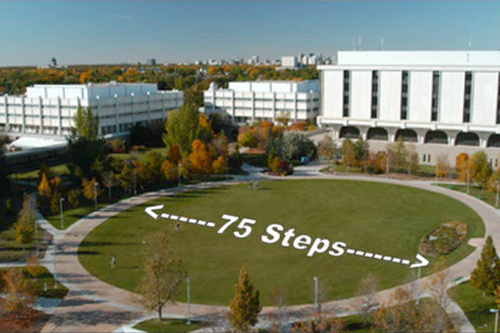 The text would ask a question like “how far is it around?” or something with a real-world spin like “how large would the ice rink be?” (standing in for “what is the area?”) and then it would explicitly define the only variable we need: 75 steps. My students would identify the formula and then solve. 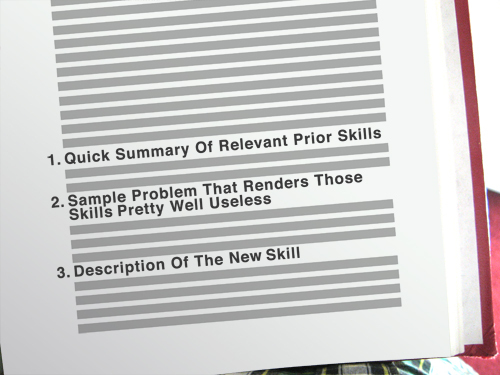 This kind of instructional design puts students in a strong position to resolve problems the textbook draws from the real world but in no position to draw up those problems for themselves. This kind of instructional design also yields predictably lopsided conversation between a teacher and his students. The fix is simple but difficult: be less helpful. Let’s start here: is circle area just something math teachers talk about to amuse themselves or do other people care? If they care, why do they care? How do we convey that care to our students? Maybe someone needs to fertilize the lawn. Maybe someone wants to spray paint the dead lawn green in the winter. Without this component, the answer to the question “how far is it around?” is little more than mathematical trivia to many students. So put them in a position to make a choice, a tough choice that’s true to the context of the problem, a choice that math will eventually simplify. In both cases, we’re putting every student on, more or less, a level playing field. They are guessing at discrete numbers (ie. “fifty bags — no — sixty bags.”) and drawing on their intuition, which, from my experience, is a stronger base coat of for mathematical reasoning than the usual lacquer of calculations, figures, and formula. This approach also forces students to reconcile the fact that the problem is impossible to solve as written. This is an essential moment. They need more information, but what? What defines a circle? Would it be easier to walk across the lawn’s diameter or around the lawn’s circumference? Which would be more accurate? Why is the radius difficult to measure? Did Kyle really walk through the center of the lawn or does he just think he did? When you write “75 steps” on a photo, that conversation never happens. My thanks to Kyle for jogging my thoughts here. design, redesigned, what can you do with this? Everyone out there seems so full of love for the students and the job that it carries them through the long hours, but it hasn’t been enough for me to break out of the vicious cycle of frantic work and procrastination I’ve been stuck in since first grade. teaching’s jarring transition — from sleepwalking into your 08h00 MAT 180 class to teaching your own classroom of sleepwalkers where every bad work habit you’ve accumulated over your entire life pays off huge negative returns. Let’s table this post for a few years. It took me five years to feel even a little put-together in this job, to feel like I wasn’t just scrambling to keep pace, but I give Alison half that. Rather, scan the list of commenters at Alison’s blog, scan her Twitter crowd (Twitter account required, sorry), and tell me you don’t think she’s going to bend the induction curve upwards. Let’s assemble a control group. We’ll have the experimental group spamming questions at jackieb, jdyer, dcox21, colleenk, samjshah, k8nowak, sweenwsweens, dgreenedcp, et al, while blogging the experience as time permits. I don’t know if it’s any kind of model. I only know it would’ve made me a much happier teacher, much sooner. The deceit here is vaguely mathematical so I asked my first class of students, “What is it selling and how does it try to sell it?” Most identified the product as some kind of weight loss formula and/or protein shake. No one identified the deceit. So I asked my next class, “What is it selling and how does it lie?” Many suggested we were looking at two different people here, which I said was false (with about 99% certainty). One student thought the ears were the giveaway, which is true, though not the giveaway he thought they were. I guess I’m curious a) if you notice the deceit and b) if there’s any way to translate that deceit into an actionable math unit? Update: Yeah, it’s the distortion, which is about 17% too wide in the first image and 17% too tall in the second image. Should it worry me that none of my students caught it? Here are my estimations of the undistorted images. Graph: effectiveness of ad v. percent distortion.